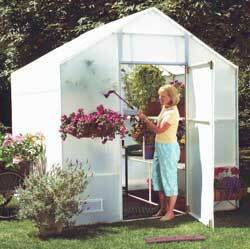 Call Us At 888-326-8634 For Discount & Sale Offers On Solexx Harvester Greenhouses! - just level the ground beneath it. A master gardener's delight or the hobbyists dream - the aesthetically pleasing Solexx Garden Master Greenhouse is perfect for the gardener who want to maximize their growing space. With 6'6" outer walls and a gable that peaks at 8'9" you will have ample room to trellis plants like cucumber, cantaloupe and tomatoes. The steel-reinforced bench frames give you lots of growing area and each shelf supports up to 500 lbs. of distributed weight. Plant hanging rods run the entire length of the greenhouse and support 200 pounds each so you have plenty of space to overwinter all your hanging baskets. Strong and shatter-proof, double-walled Solexx panels will protect your seedlings and plants from strong winds, hail, driving rain, snow, and other harsh weather conditions. With our insulated Solexx panels, you will keep heating costs low while extending your growing season from early spring to late fall. Unlike other greenhouse coverings, our double UV inhibitor is added as the plastic is processed, and is not just a coating. Solexx panels create an evenly diffused light so no matter where your plant is in the greenhouse, it will benefit from optimal growing conditions. The Garden Master comes standard with 3.5mm Solexx panels or upgrade to 5mm Solexx Pro in high altitude, heavy snow areas. AP-G-508 8'x8'x8'9" (3.5mm) High capacity, built-in bench frames, New stronger and lockable doors, Full-length hanging rods (hold 200lbs each), Twin-Wall Solexx™ paneling for optimal plant growth, Large Easy Flow Louver air vent, Heavy duty composite framing - rust, corrosion and mildew free 5mm panel upgrade available for high altitude, heavy snow areas. FREE Delivery! (in the contiguous 48 states) $ 2,632 AP-G-508-D 8'x8'x8'9" (3.5mm) Save $77 with the Deluxe Bundle! Delux kits add the following items to the standard kit. Sturdy Wire Shelves to fit bench frames (3 - 8' side shelves), Solar Louver Opener (1), Greenhouse Base Vents (4), Tie Down Kit (4 anchors).